With the exception of the “Turbo Putt,” the different putting styles are pretty evenly distributed among disc golfers. 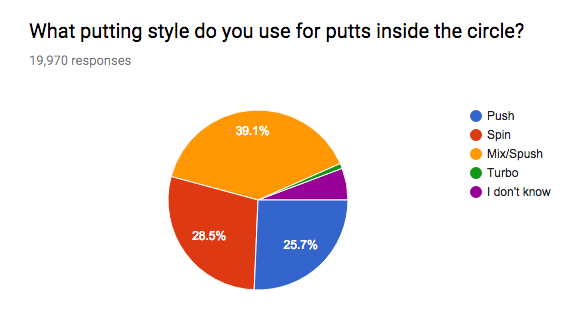 28.5% of respondents said they use the “spin putt” while 25.7% said they push putt. 39.1% putt using techniques that combine elements of both the spin and the push putt. Less than 1% of putters regularly Turbo Putt from inside the circle, so if you’re among this minority, congratulations! You are in the 1%. When it comes to putting stance, almost all disc golfers use the traditional staggered approach. Only 10.9% of surveyed disc golfers use a straddle putt. One of the more controversial disc golf calls is the “jump” or step putt. Those who don’t jump putt feel it is an unfair advantage. Those of us who do jump putt think the 10 meter rule is fantastic as it makes it easier to make long putts. Slightly more than half of those surveyed jump putt while 47.5% said that they do not jump putt outside the circle.